Canadian Doctors for Refugee Care is organizing a fourth National Day of Action on June 15th to take the facts directly to the streets and tell Canadians the consequences of the federal government’s cuts to refugee health care. Despite widespread opposition from a broad group of health care workers across Canada - and now a federal court decision calling the cuts "cruel and unusual" - the federal government has stuck to its efforts to deny health care to refugees. As predicted, many have suffered and continue to suffer as a result. There have been well documented cases of people being denied care including pregnant women and sick children. Health care workers join others in continuing to speak out for those who do not have the opportunity to do so. 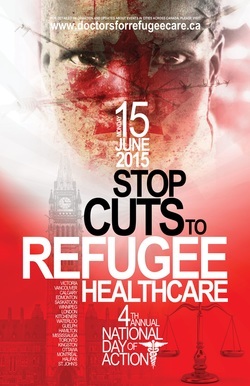 Join us on June 15th for the fourth National Day of Action. It is an opportunity to show the Federal Government that Canadians will stand up for the most vulnerable among us. Please visit http://cdrcdayofaction.com for a list of participating cities. For more information and for media inquiries please contact Christopher Holcroft at chris_holcroft@yahoo.com/ 416-996-0767.